Japan is the world's largest donor in the water and sanitation sector and has provided assistance based on its experience, knowledge and technology. 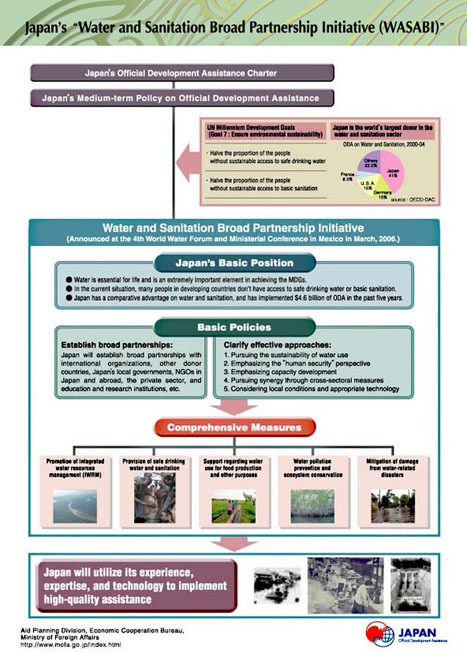 Japan announced the "Water and Sanitation Broad Partnership Initiative (WASABI)" (March 2006) and launched the "United States-Japan Clean Water for People Initiative" (September 2002). Japan wants to see global cooperation on this issue with international agencies, other donor countries and both Japanese and non-Japanese NGOs further strengthened. Japan hosted the Third World Water Forum in March 2003, helped ensure the adoption of the resolution on the "International Year of Sanitation 2008" at the United Nations General Assembly in December 2007 and supports multilateral cooperation in this area. Japan has continuously been the largest donor among the DAC countries and has implemented US$4.9 billion of ODA in five years between 2001 and 2005, which accounts for a massive 38% of the total support received from bilateral donors. With regard to strengthening international partnerships, Japan has been working with the Unites States on the Clean Water for People Initiative. At the Fourth World Water Forum, both Japan and the United States held sessions and joint conferences and launched this partnership. Japan and U.S. are currently exploring how to attract private funds for the development of regional water and sewage infrastructure by combining Japanese ODA loan from Japan Bank for International Cooperation (JBIC) with USAID investment guarantees. Indonesia, India, the Philippines, and Jamaica, have been chosen as pilot countries. In the Philippines, the Municipal Water Loan Financing Initiative (MWLFI) was implemented in March 2006 as the first project with funding from both Japan and the United States. The Philippine Water Revolving Fund (PWRF), which is a new financing scheme that promotes private sector investment through more efficient and sustainable means, is in the process of being developed. The PWRF builds on the experience and mechanisms used in the development of the MWLFI. Poverty reduction is a key development goal shared by the international community, and is also　essential in eliminating terrorism and other causes of instability in the world. Therefore, Japan　will give high priorities to providing assistance to sectors such as education, health care and　welfare, water and sanitation and agriculture, and will support human and social development in　the developing countries. At the same time, sustainable economic growth, increase in　employment, and improvement in the quality of life are indispensable for realizing poverty　reduction and Japan places importance on providing assistance for these issues accordingly. In order to improve the quality of life of the poor, Japan will actively assist in the enhancement of basic social services, such as education, health services, safe water supply, shelter, and electrification, while encouraging improvements in governance in the recipient country. For example, Japan will seek to improve hygiene conditions and raise awareness by providing wells and latrines in its school construction projects in poor areas, and to improve children's nutrition through school meals. With a view of strengthening the delivery of basic social services, assistance will be provided to build the capacity of central and local governments, and to improve health and medical systems. At the same time, the establishment of transport, communications and electric power infrastructure will be assisted with the objective of improving access to hospitals and schools. Support will also be provided for training and development of educational materials in order to improve the quality of services. In addition, assistance that will contribute to women and children's health and reproductive health will be provided, addressing infectious diseases and women's capacity building. The water facilities in Phnom Penh were destroyed during the chaos of the civil war which lasted up until the early 1990s. In addition, because they had been neglected for a long time and had deteriorated, their treatment capacity had significantly decreased. Through grant aid, Japan has repaired the water treatment plant of Phnom Penh's water supply facilities, provided water meter equipments and upgraded the drainage pipes in the city. Thanks to over 10 years of support, the treatment capacity of water facilities in Phnom Penh has improved to twice that of when the civil war ended. As a result, the area where sanitary water could be supplied has expanded significantly, and the rate of water supply distribution increased to almost twice. In addition, 24-hour water supply has become possible. In this way, the water supply condition of the city has improved to a great extent. Japan promotes human resource development for the water projects through technical cooperation in coordination with the development of infrastructure, in pursuit of further efficiency in operation, maintenance and management of the facilities. Japanese experts dispatched from Kitakyushu City Waterworks Bureau teach skills on site and formulate manuals together with local officials. In this manner, Japan and the local government coordinate as a unit in supporting the capacity development of staffs in facilities. Flush toilet, 'KOSHU'. Local elementary school children painted the wall. In Lusaka, the capital of Zambia, residents suffer poor sanitary conditions. Their sanitary infrastructure is overstretched as a result of the influx of people from rural areas. Japan has provided support, in coordination with NGOs, targeting low-income districts with the highest incidence of cholera in Lusaka. As part of the “KOSHU” project, Japan installed a public flush toilet facility and shower where there once was a garbage dump. An average of 30 people per day use the facility even though it is a paid one. In addition, Japan has provided health and sanitary education to residents. The residents are so committed to improve living standards that they maintain and manage "KOSHU" by themselves. The maintenance is funded by fees collected from the users of the toilet and shower under the guidance of Japanese experts. Such support has significantly decreased the number of cholera infections in the district to only one case in 2004.